Recently, I went on a day trip with my friend Kunal. I wanted to go so I could continue exploring Rajasthan. We traveled to the Sas Bahu Temples, Ekling-ji, and Delwara. 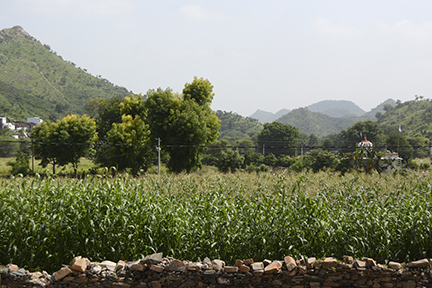 All of these locations are rural and Delwara is just outside the Udaipur district. First we stopped at the Sas Bahu Temples. According to a plaque at the site, the temples date to the early eleventh century. Sas Bahu translates as mother-in-law and daughter-in-law, Kunal told me that this was the only temple in India dedicated to the relationship between mother-in-law’s and daughter-in-law’s. It is interesting considering the stories I hear about these relationships. Many times it does not seem like mother-in-law’s and daughter-in-law’s get along well here in India. At the temple complex it was relaxing. The weather was mild, so it was pleasant to be outdoors. There were also few people there, so it made looking that the structures easy. First we walked around the perimeter and then looked at the details of the temples. The temple complex contains two main temples, so it is small and it did not take look to explore the whole site. I found the roof structures to be the most interesting things at the site. They were made from brick and not the stone typically seen. If you need a break I suggest you go to this temple. The grounds are clean and well maintained. After leaving the Sas Bahu temple, we headed to Ekling-ji. The small town of Ekling-ji is known for a Shiva temple. This temple is maintained by the Mewar of Udaipur. I do not know if it is because the temple is active or because of the connection with the royal family of Udaipur, but you are not allowed to make photographs there. The temple is beautiful on the inside. Some of the architecture framing the Shiva lingam is gilded in silver. You walk in and walk to a small counter where you can leave an offering. I gave a garland of small flowers. The idol is located about 10 feet behind the counter. Between the counter and the Shiva lingam there is a chandler hanging from the ceiling, it has a floral design and it is made of silver. The internal sun, symbol of the Mewar of Udaipur is also visible. In the center of the room is a silver statue of Nandi. Nandi is a bull and is the vehicle of Shiva. In the open space people were gathering. Kunal told me they were about to perform Aarthi and asked if I wanted to stay. Aarthi is a part of the puja ritual, where light from a wick soaked in ghee or camphor is offered to the god; meaning the smoke is offered to the god. There was also some singing by the audience. The audience also fans the smoke into their faces. We joined the rest of the people in the gallery. One of the woman told me I had to whisper a wish into Nandi’s ear and it would be granted. Nice! After the Aarthi, we left the temple complex. Ekling-ji is seriously one main road, so we walled down it and I took a few photographs. It had some nice things to photograph. I also bought a picture of the Shiva lingam from inside the temple since I could not make a photograph. Once we were finished at Ekling-ji, we went to our final destination of Delwara. From what I had read online, it is called the town of temples. I did not see that many temples. However, it is famous for its two Jain temples. I really like the town of Delwara. It is small and there were not many people, no tourists. Having few people makes creating photographs easier. I would love to visit all of the small towns of Rajasthan. I also still need to visit some villages. We walked through Delwara and I happily made photographs. We were looking for the Jain temples and came across one under construction. There were two men on the site and they let us look around. One of the works told Kunal they had been working on the temple for 7 years and they would be done in 2 more years. As we continued or wall, Kunal asked several locals where the Jain temple was. We made it to the temple and it was locked. There was a phone number on the building so Kunal called it. I can’t remember if Kunal talk to someone on the phone or not, I was making photographs. Anyway, we walked back into the center of town and found a man in a little shop. He was sleeping. He was obviously connected with the temple as there was a poster of the temple on the wall. The man went back to the temple with us and let us in. When we got there, the man told us we could not make photographs inside. Went inside and first went to the main sanctuary. The man wanted me to have a look, he told Kunal I could sit and mediate. I sat down on the ground for about a minute. Kunal put some money in the temple donation box. Then as we were looking around, he told us we could make photographs. However, I only made photos with my phone. The temple was very nice. Not as elaborate and large as the Jain temple at Ranakpur but still a noteworthy Jain temple. Once we left the temple we explored the rest of the town. We came across a Hindu complex. There was not a big main temple, instead there were small shrines with deities in each of them. There were several men there and one of them gave Kunal directions on how to walk around the rest of the town and meet our driver. From this complex, we could see the old palace of the city. It is now a heritage hotel. As we walked through the rest of the town we came to an outer road. From there we could see fields with the palace hotel in the background. It seemed like it would be a restful place to stay. The last notable thing we saw was the old step well. It was interesting because it had an old wheel that had been used to draw up water. Near the step well we found our driver. From there we headed back to Udaipur. Mission complete. I hope I get to go back to Delwara, it was a friendly little town. Hey! We will see. We will talk about where you want to go.